Today we are releasing a new update to EmpireAvenue.com that updates our navigation and consolidates many of the styles and look throughout the service. The impetus for this update is to continue along the path towards accomplishing our mission for Empire Avenue where you will realize real value for your reputation and the networks you have built online. Engage has been replaced with a relatively new home page which we've had for a couple of weeks, but expect that to be the focus of much attention and updates going forward. The page now features people and missions we have highlighted for you using our algorithms as well as Recent Shareholders, Mentions and Arrivals as before. You can reach this page by clicking "Home" on the top bar, or the Empire Avenue logo. Expand has been replaced by a new section called "Discover" where we will be able to give you options to discover new people and their services now and into the future. Expect further updates to the Discover dashboard. 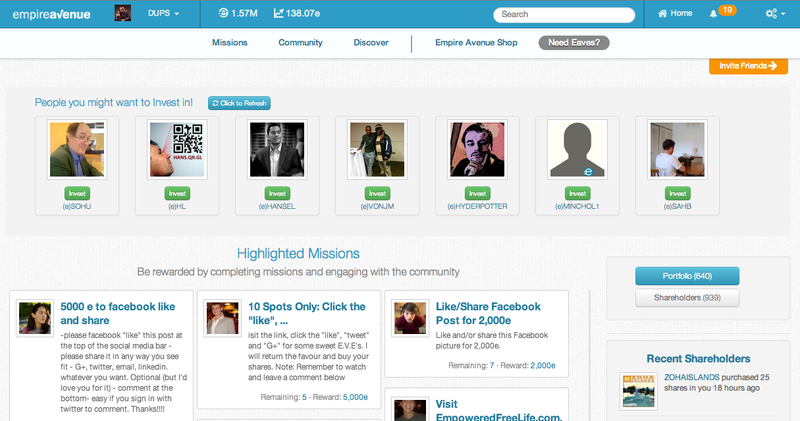 Leaderboards for people/profiles, Search and Recent Arrivals are all under Discover now. The Communities Leaderboard is now in the Community section as "Top Communities"
The Empire Avenue Shop has been reduced to two pages, taking out unneeded complexity. Lists: Twitter, Facebook and LinkedIn Friends on Empire Avenue as sortable lists have been removed, we will be working on ways to notify you of when a friend joins better than we do today! Profile: Hovering over the network score now correctly gives you the network activity. In case you are not a member of the Empire Avenue General Discussion Community or do not visit there often, some of our other changes have included Missions Enhancements, more useful Mentions, New Block Policy (implemented and active as of May 6th) and many more. There are numerous small fixes throughout the site and many other enhancements that you cannot see (as always), way more than we can actually list. Many of these changes may seem minor but move us towards a greater consistency with which we can make changes more easily and reliably. If you would like to keep abreast with updates on what we are releasing, please join the Empire Avenue General Discussion Community on Empire Avenue here!